Shellfish provide basic food nutrients and are an important part of the Mediterranean diet, one of the most well balanced meal plans which allows proper nutrition without weight gain, maintaining the adequate weight for each person´s size and age. Carbohydrates: Shellfish only contain 1% of this nutrient, but between 1.9 and 4 grams can be found in every 100 grams of oysters and mussels. Minerals: Shellfish are rich in phosphorus, potassium, calcium, sodium, magnesium, iron, iodine and chlorine. Oysters, clams, baby clams, mussels and cockles contain the most iron. Vitamins:Shellfish provide group B vitamins, especially B1, B2, B3 and B12, and to a lesser degree, vitamins A and D.
Purines: This type of protein is metabolized into uric acid. The average purine content in shellfish is between 18 and 20 milligrams for every 100 grams of shellfish. Fats: Shellfish contain very little fat, thanks to their high water content. Every 100 grams of shellfish contain 80 calories, but this amount can increase depending on the cooking method. It is also known as a prawn. It belongs to the Caridea family. It is a decadopodus crustacean that can live both in freshwater and salt water. It lives in warm, tropical and cold regions. It inhabits rocky and sandy areas that are not very deep and with a lot of algae. This is a decapod crustacean that lives in the depths of sand and sludge. It lives at depths of between 500 and 2000 metres. It belongs to the Palaemonidae family. It is a good swimmer and its migration distances are considerable. This is a crustacean that has 10 legs, typical of the Western European coast. The colour of its shell is pinkish-yellow and it can measure around 15 to 25 cm. It is not very resistant so it only lives for a short time out of water. All small marine crustaceans with 10 legs, with developed abdomen and flexible shell are called prawns. The white prawn lives in the depths of the Mediterranean and of the Atlantic. All small marine crustaceans with 10 legs, with developed abdomen and flexible shell are called prawns. 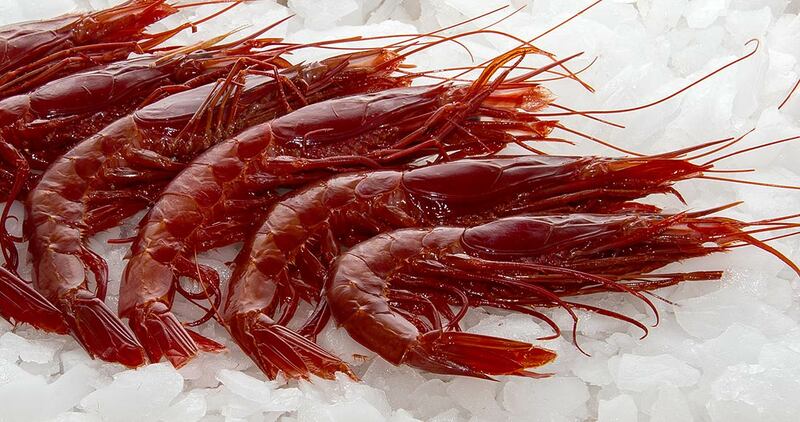 The red prawn is really the traditional prawn or pink prawn. Prawns are marine crustaceans with an elongated body similar to the king prawn but smaller in size. Its meat is white, compact and very tasty, making it one of the most popular and highly appreciated seafood on the table. This crustacean is currently one of the most highly consumed species due to the development of its controlled breeding in coastal areas. There are several varieties of shrimps originating from different seas.